Welcome to the next instalment of Dog Tails. When clients visit us for studio pet portraits, they often recount the stories of their dogs lives. With each dog being different, so is each story. Some are happy tales, some inspiring, some sad, but each one ends with love as their dog subjects find a place and person to call their own. 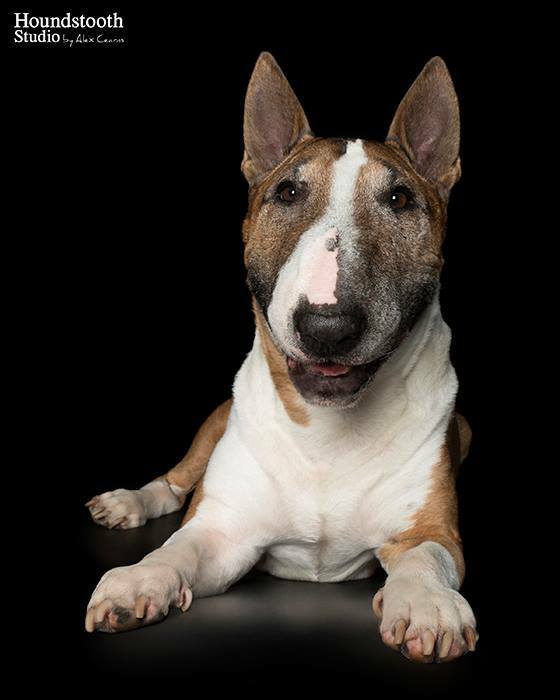 Last week we had a visit from Kerry with 10 year old Bull Terrier, Stig. Kerry says “Stig was born just a few days after my old staffy passed away. He is named after the racing car driver from the TV Show Top Gear. I had just been introduced to Dryland Sled Dog Racing and knew Stig was going to be a racer. Stig loves sled dog racing with the huskies and he tries very hard – however he’s not very fast. We have travelled to Victoria twice to watch his husky friends race in the snow and he competed in the Sled dog National Championships in Canberra. This year he will be competing in his 2nd national Championships in Busselton.